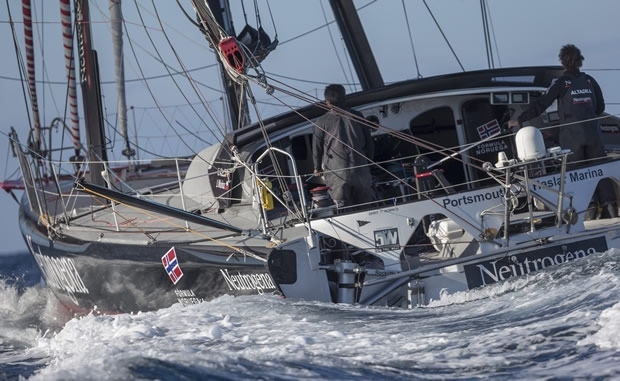 Bernard Stamm and Jean Le Cam passed the '5,000 miles to go' mark to the Barcelona World Race finish line today also crossed over their own outbound track. The leading crew is starting to feel like the worst of the course is behind them. Both skippers have, individually, suffered more than their fair share of ill luck over their careers. Now, if it is not good luck that is running with them, it is certainly at least good timing. Having been pressed east around the big high pressure system on the west side of the South Atlantic, they continue to have downwind and broad reaching conditions, making 16.3 knots today. But as daytime temperatures rise to become much more acceptable, Stamm and Le Cam seem set to gain steadily on their nearest rivals, Neutrogena and GAES Centros Auditivos. Had it not been stuck, then there might have been some ceremony yesterday when the leaders attempted to slide forwards the protective canopy which protects much of their cockpit, that has been resolutely been deployed to protect the crew from sluicing Southern Ocean waves and driving winds. After a little persuasion they can now return to the full 'al fresco' experience, rather than huddling under its shelter. And as the canopy rolls back, so too it seems like the weather door may close on their rivals. It is probable that as a new high pressure builds off the South American coast that Neutrogena and GAES Centros Auditivos will lose more time agains the Swiss-French leader. Guillermo Altadill and José Munoz on Neutrogena have actually been making distance on the leaders, reducing their deficit by a further 30 miles over the last 24 hours. They may now be 970 miles behind the leading duo, but their route north now appears blocked by the high bringing with it winds of just 5-8 knots. In contrast Cheminées Poujoulat will be into slightly stronger, more settled easterlies allowing them a due north course to the Equator. Predictably, the race statistics so far show in favour of Cheminées Poujoulat. Until today they have sailed 21,080 nautical miles on the water, averaging 14.6 knots. They hold the highest 24 hour run at 482.8 miles (on 11 Feburary), the highest four hour speed gun average of 21.1 knots on the same day. They have led continuously since 16 January. Their lead was biggest at 1249 miles on 26 Feburary. And they are on course for the biggest win in the history of the race. Stamm said today: "It feels good to change things a bit. We pushed back the protective cover for the first time yesterday. It was a bit stuck and we had a bit of a job pushing it back, but it’s nice now to be able to manoeuvre standing up rather than crouched down under it. When we trim the headsails, we can see them now. That changes things. The speeds are different and the situation has changed. "What’s happening is that with the lead we have, we can’t control anything. We’re sailing our own route with the weather we get. The high we have just passed was something we had been keeping an eye on since before Cape Horn. We were afraid that it would stop us getting through and that by having to move off to the east, the door would be wide open behind us. But that isn’t the case, and it seems to have favoured us. "The high was moving. The fear was that it would remain there, but it’s moving again. It’s possible that the door will slam shut again." For the 'three Pacific musketeers' approaching Cape Horn - We Are Water, One Planet, One Ocean & Pharmaton and Renault Captur - conditions remain favourable. But Jorg Riechers and Seb Audigane on Renault Captur in sixth are ahead of a big low, seeing 30-35 knots of northwesterly winds right now, and there is a big low forming off the coast of Chile which will leave beh ind very big seas as they arrive at Cape Horn at the weekend. We Are Water has just over 1000 miles to make to the Horn. Renault Captur's crew is having to moderate its speeds so as not to put too much pressure on their starboard rudder too much, but they have still been making steady miles under double reefed main and J3 headsail. Reichers reported today: "For the moment it is okay. We have the J3 and two reefs and that is easy enough. It is OK. We had the J2 and the J1 yesterday and we had some scary moments. So we decided to take it a little easier because where we are here you really do not want to have any problems. "For the moment the problem with the rudder, which was delaminated and damaged south of New Zealand, is that when it was repaired it was done so without a mould and so with the shape it has it might be a few millimetres out of the range of the original rudder and that creates a lot of pressure on the blade. We think that is the source of the problem." "If we did not have this rudder issue it would be a glamour becasue the boat is going quite well, and Seb and I are going really well, so the manouevres are alright and so life is really good. But knowing we have this rudder issue is like having the sword of Damocles always over us all the time. It gives us a certain amount of stress."